Finland’s JEE, or #FINJEE, was kicked off on Monday, 27 March at the House of Estates in Helsinki. State Secretary Paula Lehtomäki of the Prime Minister’s Office noted in her opening remarks that the theme “together” is characteristic to the many important and ongoing processes, including the Agenda 2030, Finland’s 100th anniversary – and health security. Secretary General of the Security Committee Vesa Valtonen spoke about Finland’s Security Strategy for Society that brings together different sectors of the Government, non-governmental actors and the business community at national and local levels. Mission lead Anders Tegnell of the Public Health Agency of Sweden set out the agenda of the week, and co-lead Dr Nirmal Kandel of WHO presented the JEE in the IHR Monitoring and Evaluation Framework. According to Dr Kandel, a good self-assessment is a basis for a good JEE, highlighting the importance of preparation by the country itself. Permanent Secretary Sillanaukee and Permanent Secretary Jaana Husu-Kallio of the Ministry of Agriculture and Forestry presented the Finnish health system that will undergo a health, social services and regional government reform in the next years. In view of this, the JEE recommendations will be timely. In the afternoon, the group of experts started working on the 19 technical areas. On Monday, there were four Prevent items on the agenda: National Legislation; Policy and Financing, IHR Coordination, Communication and Advocacy; Antimicrobial resistance; and Zoonotic diseases. Each presentation of a self-evaluation was followed by discussion. The JEE process is about dialogue and mutual learning, and a key strength of the process is the expretise and interaction among experts from various sectors on both the self-evaluation and external team’s side. The first, long day of the JEE mission officially ended at 6.30 pm, with the external group continuing discussions and preparations for the next day. Hopefully they got to see some of the Finnish sun that starts to come out again. On Tuesday the experts formed four groups: three of the groups spent the morning on a site visit, and one of the groups discussed two technical areas at the National Institute for Health and Welfare, namely Prevent 5: Food Safety and Prevent 7: Immunization. 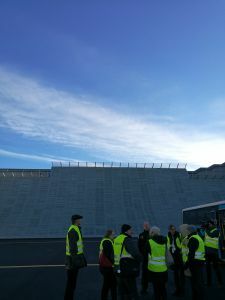 One of the three site visits took place in the Helsinki City Rescue Department that provides accident prevention, rescue operations, emergency medical services, and civil defense and preparedness in the Helsinki area with 800 000 inhabitants, commuters and visitors. The visit left the participants with an overview of the functioning of the department, as well as a key lesson: preaparedness is all about training. In the other sessions of the day, the group discussed workforce development (Detect 4), biosafety and biosecurity (Prevent 6), and real-time surveillance (Detect 2). 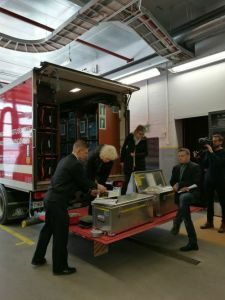 Wednesday and Thursday have been intensive days filled with lively conversations and insightful site visits to the Helsinki Airport, the laboratory of the Finnish Food Safety Authority, and the Radiation and Nuclear Safety Authority, among others. The external group does not hesitate to challenge the national experts, both in terms of JEE scores but also the thinking that lies behind some of those scores. Finland is a small country, Finns tend to say. No, you are not, noted the evaluators (the country is 1150 kilometers long) – you are just few. Point taken. On the evening of the third day, Permanent Secretary Sillanaukee of the Ministry of Social Affairs and Health hosted a dinner to the external team together with Under Secretary Elina Kalkku of the Ministry for Foreign Affairs, and Permanent Secretaries Jaana Husu-Kallio of the Ministry of Agriculture and Forestry, Jukka Juusti of the Ministry of Defence, and Harri Pursiainen of the Ministry of Transport and Communications. Lively discussions brought together different perspectives of comprehensive health security in the 195-year old Government Banquet hall. On Thursday afternoon, the last session (Chemical Events) concluded the technical area discussions. Time to get ready for the recommendations of the JEE team. On Friday morning, the team held final discussions. 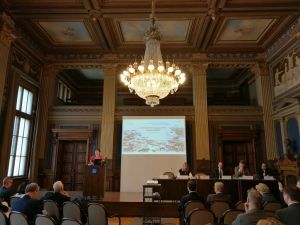 In a suddenly snow-covered Helsinki, experts, representatives of ministries and agencies, as well as the Finnish media, gathered in the Government Banquet Hall, where the JEE team presented the final feedback, scores and key recommendations . The results highlighted the need to ensure the overall good level of preparedness in the implementition of the health, social services and regional government reform. The lack of broad, severe health crises in the past should not lead to complacency, the team noted. Finland was encouraged to continue strengthening its well-functioning multisectoral, multistakeholder work at all levels. Finland was the first EU country to undergo a JEE, and co-lead Dr Nirmal Kandel of the WHO hoped that this will encourage other EU countries to volunteer for the peer-to-peer process as well. Minister of Social Affairs and Health Pirkko Mattila assured that the recommendations would be studied carefully, and informed that Finland will prepare its national plan by the end of 2017.